I had planned to do some layered Konad stamping with red, white and blue stars and stripes and glitter and whatnot, but then I couldn't find my Konad plates and it was so hot my white base polish started bubbling... So I said 'screw it' and used these Inque decals instead. The style is called Proud To Be and it features an American flag waving in the breeze. I used the custom sized nails again. They seem to fit better on my right hand than my left hand, as you can see in the pictures. They're a little too narrow, and they taper too much so they bunch up at the tips. They're really not as close a fit as I had hoped they would be- I mean, they were measured from my actual nails! I should have tried the un-sized ones this time. What I like about these Inque appliques is that the designs are actual photos. You can get custom ones, too. Not something I can duplicate with Konad. I really hoped I could get them to work this time. The problem I have with these is that they peel like crazy. From the moment I apply them, they drive me f#@^$! BONKERS. The edges are sticky and weird feeling and they peel up and feel so awful that I can not wait to take them off. These are not even 24 hours old in this picture and look what happened. I applied them yesterday afternoon and this is how they looked when I woke up. They started peeling the minute I put them on. I was really careful with my application this time, too! Nail polish remover (be thorough) to take off polish. Any filing on my free edges of my nails where I need smoothing or shaping (largely because of my job beating up my nails). Wash hands with soap & water using nail brush to really get the nails clean. I use the stickers that are standard sizes (with such short nails and nail beds I can get the long ones for some designs & cut them in 1/2 to save for my toes for another day). Being right handed I start with my left thumb. I pick out the right size for one nail, stick it down using the cuticle edge & right side of the nail bed as my main guides to line it up really well, don't press it all the way down yet leaving it stuck only partway down (mainly on the right), then eyeball it to see if it needs trimming on the left side of the nail bed, do a quick mini-trim on that left side if necessary w/ some big toe-nail clippers, then press it down with it fitting pretty well. I rub the sticker down all over with medium pressure w/ my fingers & check to see how much overhang I have over my free edge. Using the nail clippers, carefully clip off only the bulk of the sticker hanging off my free edge. I proceed to do one whole hand like this. It takes time. I then go to the hairdryer & have a dry hand towel & dry wash cloth set up. W/ the hand towel under my hand for comfort, I heat up one nail w/ the hair dryer starting on medium & move up to higher heat for as long as I can tolerate. As fast as possible I turn off the hair dryer & set it down. I rub really hard w/ the washcloth corner(to keep from accidentally scratching myself - or if I am done w/ one hand already, from ruining my other work) focusing on rubbing from the center to the edges of the sticker. I press hardest on the edges, pressing through the wash cloth with my right thumbnail to really stick it down. You only have 10 seconds to do this in @ the max. Then I repeat the heating process doing each nail separately, I don't heat 5 nails @ once & try to get them pressed down, they'd cool too fast. Then I file vertically w/ a medium coarse (not crazy coarse, medium fine should work) nail file to get the excess off. Then I do the other hand the same way. Once both hands are done & excess is filed off all nails, I reheat one nail @ a time & re-focus each time on the edges of the stickers. I press HARD w/ my thumbnail on top of the washcloth or it's corner on each nail to really get it to stick. This works well for me. I do not wash my hair or take a shower right after doing this, I give it a few hours before I do anything that would soak my hands for more than a hand washing." Unfortunately, even these tips still didn't stop the peeling for me, but since they work so well for her, they may work for someone else. This is only the second time I've tried to wear these, but they're so much of a hassle that I don't think I'll wear them again. I'm so disappointed about that because the designs are AWESOME and I want pictures of feathers and snakeskin and giraffe fur on my nails... But I can't deal with the peeling. They're so uncomfortable when the edges get sticky and peel every time you touch something! Jen, lol!! I thought it looked cool, but then it looked like it was wrinkled on my nail, I kept trying to smooth it down! The idea of these is so cool! I don't think I have the patience to apply them, plus I am a super nail polish picker, so these would be picked to death at the first sign of peelage! Do you put top coat on? Would that help? 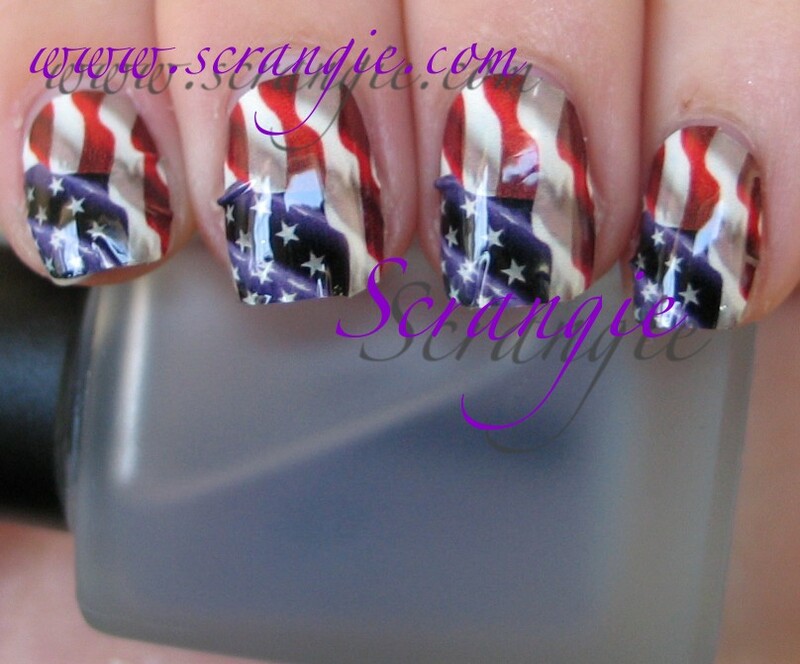 I'm yet t try stickers or wraps, you get more for your money out of a bottle of polish, but these look amazing! 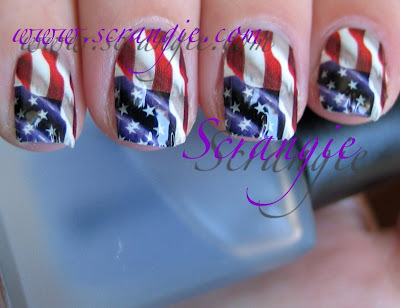 The waving flag design is a big no for me; it makes it look like your nails are all crumpled up and pulling off! D: The image would be much better without the wavy effect. That design is creeping me out! It looks like your fingernails are all warped and wavy! I'm sure it's partly because of the flattening textures go through in a photo (as opposed to in person). I wonder if Sally Hansen can work with micro - layers of polish to make more photo-realistic Salon Effects strips. Maybe like a silk-screening process? It seems like more people have success with the polish strips instead of the decals. these are really cool. though it sometimes looks weird, I try to leave space between the sides of my nails and the tips of my nails when I apply nail stickers- . I havent gotten around to trying these types of full nail designs yet, though, seems more like concept nails rather then a ware-able manicure. I had the exact same problem when I used Nail Fraud nail stickers... although the ones I had lasted for about 4 days, I finally ended up taking them off because the peeling was driving me crazy. That's a cool design though. Bummer for sure! Looking at them in the first photo I thought wow! They made some of those overlays that look like waving flags! Then I saw the lifting. We don't have anything but the Sally Hanson brand around me. I have 2 sets and yet to try them. I've loaded a cart with these and stopped myself several times now. Thanks for saving me the trouble. That peeling up on the edge would make me crazy. I hope they make some improvements since their designs are fantastic and I'd love to try them if they made them more minx-like. I love it!!!! So neat looking. By the way, I am your new follower! This particular print looks so real. The wave of the flag and all that. Sorry it didn't work out on you. I've only used Sally Hansen strips before and had great success with those. I am incapable of resisting peeling anything that is peeling on my nails! When I was a kid I loved the "peel off" polish but it never lasted more than a couple hours! 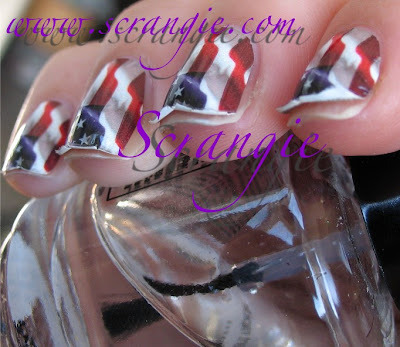 OMG your nails look like they'r crinkly!!! 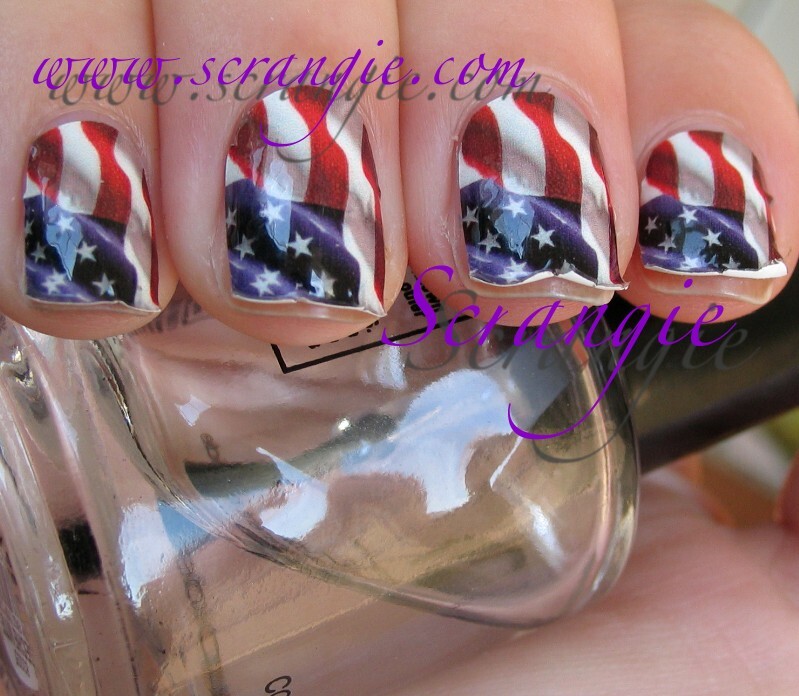 Don't think I could stand something like this on my nails. Shame you have so much trouble with these. Love the design.